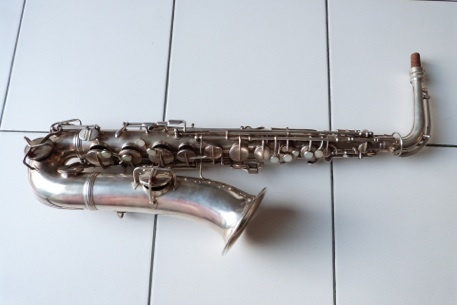 This saxophone is not an alto but a tenor in C (i.e. 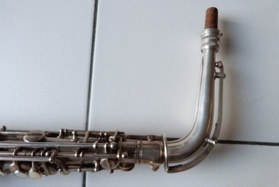 C-melody) built by Conn, with a flat neck (with the special tuning system typical of Conn’s instruments at this time). 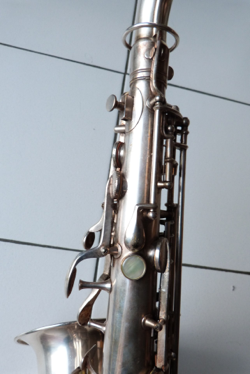 The tube of this C-melody is very similar to other american makers in the beginning of the 20th century : rather close to an elongated alto. 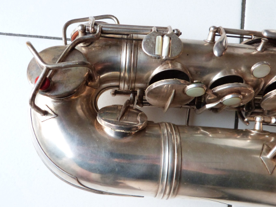 Anyhow, as we can see it, the instrument is very well done : perfect silver plating, mother of pearl on every key (even the low register rolls and the thumb rest). The factory seems to have spared only on finish ... (we’ve seen worse since) ! This model engraving is rather simple, contrasting with the delirious graphic drawings of the gold-plated «artist models» aimed to professionnal musicians. 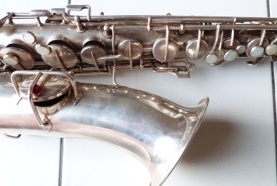 Another remark : the rolled tone-holes typical of Conn are used only on the lower part of the instrument : the left hand is deprived of them. 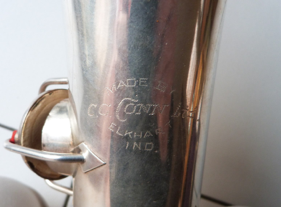 The first image shows the date and the patent number by Conn (probably concernig the New Wonder series, also known under the name «Chu Berry»). 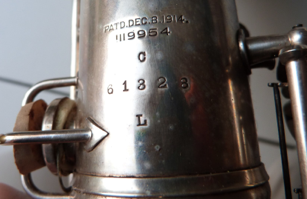 The C on the next line indicates it’s a tenor in C. The serial number of the instrument (61328) helps us to give its making date at the end of the year 1920. Finally, the L placed beneath certifies that it’s a Low-pitch model, which means it’s «tuned low» at 440 Hz. 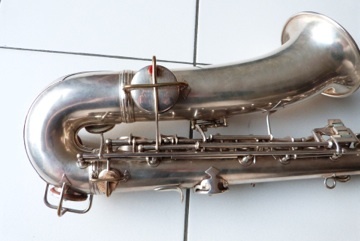 In fact, the models comporting an H are tuned at 450 Hz, which means they sound almost a 1/2 tone higher than usual saxophones, thus making them unusable in today’s ensembles. This view of the rear of the instrument shows some more interesting elements : the B and Bb keys opposed on the body, the forgotten clear E opening at the rear (condemned here by a cork), the mother of pearl rollers between low register keys. Rare for such an old instrument : not a single ding or dent on the lower part and the bell ! 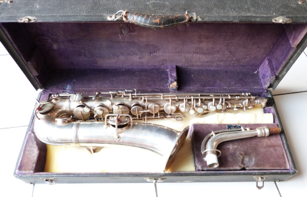 This saxophone probably hasn’t been used for a very long time in its life.